Double up! £30 for 12 classes! Includes sling hire, if required, for classes and all equipment and toys which will be provided and includes the social time after circuits class! Slinga Fitness allows you to try out different classes easily within the bundle payment scheme, as well as allowing you to have more flexibility on your attendance; you could attend twice a week, have a week off, try a different class the next, and so on; as long as you book on to each you can mix and match! The earliest is from when you have had your medical sign off from your doctor; this is usually 6 weeks for natural birth, up to 12 weeks for c-section. Onwards from this it is from whenever you feel ready to start exercising again; you can take classes at your own pace when you return, making it easy to start or return to fitness. Babywearing - My little one is over 9 months/heavy? My classes are open for mummys with newborns, up to whatever age they feel comfortable to safely bring their child to a class! 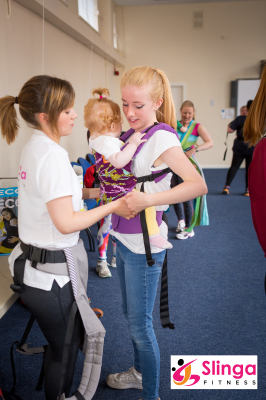 Be it in a carrier, pushchair, or safely beside you for exercise! I carry my 2+year old in class, and have older children attend alongside/joining in! Multiples & Older children are always welcome in class; no additional costs! Mummys, daddys, we even have grandmas in class! What should little one wear? Dependant on the class you are participating in, and you shall be informed more clearly upon sign up. 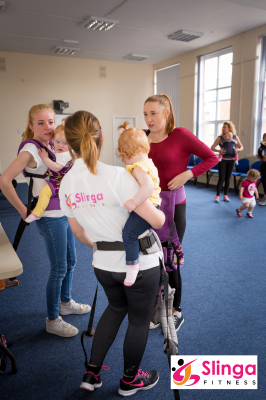 But for example, babywearing is a single layer, footless outfit such as a babygro, whereas pushchair fitness may require layers dependant on weather conditions! The classes specify there length when you book, ranging from usually 1 hour to an hour and 15/30 in length, though the fitness element usually lasts around 45 minutes. 10 minutes before class starts is normally for safety checks to ensure everyone is comfortable, happy and safe to proceed. As well as to get to know each other & social time with hot drinks & nibbles afterwards too... get to know others likeminded parents & let little ones bond too! Get in touch! All you have to do to sign up is send me a message, make payment, fill in a quick PAR-Q form, then come along! I like payment & forms to be done prior to class to save on time and formalities; I love my classes being relaxed and comfortable even when working out! I have multiple little ones... can I bring them all? As mentioned above, classes are suitable for multiples & there are no additional charges either! Classes are suitable for little ones from 6 weeks + and we've even had older children along too. Any questions about logistics, ask! I am new to exercise, is this class for me? ALL Classes are suitable for beginners onwards & I am happy to give advice regarding suitability of each. I am able to make alterations easily dependant on your fitness level, and you will never stand out! The classes are extremely welcoming & you will always feel at ease. On the other scale, if you are already very active, then allow me to challenge you & give you a workout to suit your requirements! I am pregnant, any classes for me?